Broida on Federal Sector Settlement - Dewey Publications Inc. Presented by Peter Broida, this video training course offers comprehensive instruction on settlement of federal sector cases involving adverse and performance-based actions. Dewey�s Settlement Forms for MSPB and EEOC by Broida is available for 25% off its original purchase price with each purchase of the Federal Sector Settlement Training Course. 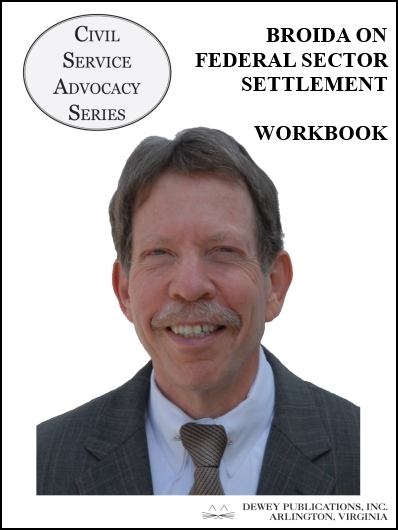 The training course, developed for attorneys and officials of personnel offices responsible for litigation of actions subject to review by MSPB, EEOC, and labor arbitrators, includes Mr. Broida�s lecture (.mp4 video sent on a CD-ROM) and a workbook. The workbook contains reference materials, course notes-outline, and a bibliography. Workbook pages are referenced throughout the video lecture, allowing users to pause the video and review the materials. Dewey�s popular Settlement Forms for the MSPB and EEOC by Broida is available for 25% off its original purchase price with each purchase of Broida on Federal Sector Settlement Training Course. Add this product to your cart and the option to add the book for an additional $125 is given on the checkout page.